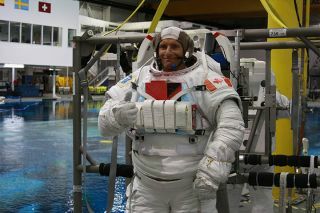 Canadian astronaut David Saint-Jacques, set to fly to the International Space Station for Expedition 58/59 in December 2018, trained for spacewalks at NASA's Neutral Buoyancy Laboratory in Houston. LONGUEUIL, Quebec — It's always a party when a Canadian astronaut is counting down to a space mission. David Saint-Jacques held his first major mission event Nov. 29 at the Canadian Space Agency headquarters near Montreal. He unveiled the experiments in which he will likely participate during his stay on the International Space Station, starting in November 2018. He spoke on stage for only about 10 minutes, but it seemed everyone in the country's space community was represented at the event. There were scientists, Canadian delegates from the International Space University, which is based in France, the chair of Canada's Space Advisory Board and even a few dozen attendees from a space conference happening on site that same day. In both French and English, Saint-Jacques rapidly walked the audience through 10 of the experiments he plans to perform on the station — including experiments examining the health of his arteries, how well he navigates and the state of his psychological health. Saint-Jacques, who was a medical doctor in Canada's north before joining the space program in May 2009, said the problems astronauts face in space are often similar to those people face on Earth. Hardened arteries are a problem for the elderly and people with sedentary lifestyles, as well as for astronauts. Bone studies in space benefit those with osteoporosis on Earth, Saint-Jacques said. In French, he added that he will be very busy with his experiments, but he plans to use his spare time to "share his perspective with Canadians as much as possible." Saint-Jacques will use photographs and social media to provide orbital views of the planet and its environment, he added. In a separate interview with Space.com, Saint-Jacques said he has just started the practical training of his mission after passing his academic exams. His practical training exams will take place in about six months, ecause Saint-Jacques is a backup astronaut for another mission just prior to his. Saint-Jacques will be the first Canadian in space since Chris Hadfield's widely covered mission of 2012-13. Hadfield, Canada's first space station commander, used social media to attract attention from all over the world. A lesser-known fact is that Hadfield ran an incredibly productive science mission on the space station, including participating in a University of Waterloo experiment called Vascular. Vascular, which is short for Cardiovascular Health Consequences of Long-Duration Space Flight, examined how stiff arteries affect blood flow. Now, Vascular's principal investigator Richard Hughson and co-author Danielle Greaves, both researchers at Waterloo, have two follow-up space experiments in store for Saint-Jacques and his crewmates. The lack of aerobic exercise leads to a form of insulin resistance, a disorder in which cells cannot properly absorb the important hormone, similar to what is found in sedentary adults on Earth. Hughson said astronauts "age" rapidly in space due to weightlessness. Arteries experience 10-20 years' worth of hardening in a typical six-month mission, for example. The new experiments look at artery stiffness (in an experiment called Vascular Echo) and cardiovascular health more generally (Vascular Aging). Hughson said he expects to recruit eight to nine astronauts for each experiment. Echo, which is ongoing, will conclude in two years, and Aging (which begins shortly) will finish in four years. For his experiments, Hughson compares the measurements from astronauts with data from seniors on Earth. In the largest collaboration in Canada of its type, Hughson's team partnered with the Village at University Gates, a long-term-care facility with 192 beds that is on the University of Waterloo's north campus, Hughson said. The facility, which opened in August 2015, allows researchers to study seniors in their residences instead of bringing them into a lab, where the results are harder to track over time, Hughson said. The company running the facility, Schlegel, will start construction on a 228-suite senior's residence on campus in the next month, Hughson added, which will accompany a $9-million expansion of his own research facilities on aging. While most of the other experiments that Saint-Jacques discussed will focus on aspects of astronaut health, the investigation At Home in Space stands alone. The University of British Columbia-led work is the first Canadian experiment to tackle psychosocial matters in space, the researchers said. Finding out how astronauts form culture in space has many potential applications, including learning how to protect spacefarers' psychological health and that of teams that participate in isolated, confined expeditions on Earth in the Arctic, Antarctic or other remote locations. Johnson will collect questionnaires from astronauts five times: twice during the mission, once before the mission and twice after the mission (three weeks after and six months after). "When you come back, you might feel different six months hence," Johnson said when explaining why she will do a second follow-up survey post-mission. The first few weeks are still filled with mission excitement, while in the longer term, astronauts face losing constant contact with their crewmates and need to reintegrate into their families. While the Canadian experiment is the first of its kind, previous, non-Canadian experiments have also explored psychological health in space. A prominent example is "Behavioral Issues Associated with Isolation and Confinement: Review and Analysis of Astronaut Journals," which NASA astronaut Scott Kelly participated in during his one-year mission in space. These "introspective reports" from astronauts "can provide useful information about the factors that affected individual and group performance during the confinement," said principal investigator and Anacapa Sciences president Jack Stuster said in a NASA brief. In the words of the Canadian Space Agency, here are brief descriptions of the experiments in which Saint-Jacques will likely participate during his mission. At Home in Space (Johnson, University of British Columbia) – Canada's first psychosocial experiment on board the ISS: It examines how multinational crews of astronauts adapt to living together in space during long-duration missions. Bio-Analyzer (Ian D'Souza, Honeywell/Com Dev) – New Canadian instrument that will perform near-real-time analysis of blood, providing data on multiple biological markers for research purposes. Bio-Monitor (Jean-Francois Roy, Carré Technologies) – New Canadian bio-monitoring system, including a smart shirt, that will monitor astronauts' vital signs and support the identification and mitigation of risks to humans in space. Immuno Profile (Chen Wang, University of Toronto) – Investigates and monitors astronauts' immune systems over long-duration missions on board the ISS. MARROW (Guy Trudel and Odette Laneuville, University of Ottawa) – Aims to establish if microgravity causes fat accumulation in the bone marrow and impacts the production, function and destruction of red and white blood cells. MicroPREP (Teodor Veres, National Research Council of Canada) – New Canadian lab-on-a-chip technology based on centrifugal microfluidics. From a sample of body fluids, this technology can isolate multiple macro-molecules such as DNA, along with proteins or rare cells required to assess immune system state. TBone (Steven Boyd, University of Calgary) – Studies the effects of weightlessness on bone quality, as bones age at an accelerated rate in space. Vascular Aging (Hughson and Greaves, University of Waterloo) – This experiment will study the repercussions of weightlessness, nutrition, physical activity and radiation on the cardiovascular system, and on the onset of insulin resistance in orbit. Vascular Echo (Hughson and Greaves, University of Waterloo) – This study examines how and why some astronauts experience arterial stiffening in space, in order to find ways of slowing vascular aging. Wayfinding (Giuseppe Iaria, University of Calgary) – Aims to better understand how space affects astronauts' orientation, navigation skills and brain function.